This weekend I feel so rough and have the worse cold I've had this year so far, I don't want to get up but of course I have to. *I made a start on a letter this weekend and it felt good. 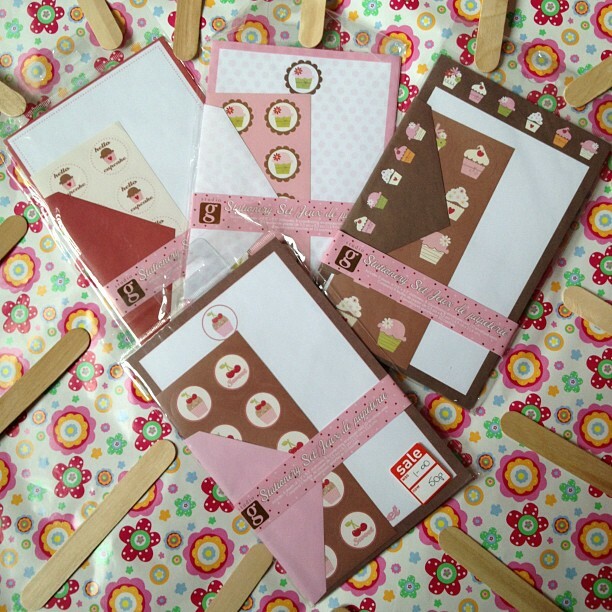 *I signed up for a lolly pop journey prompt swap on swap-bot. I haven't taken part in anything on there for ages so I'm quite excited. *I went to buy my lolly pop sticks and came across these reduced letter sets so I snapped 2 of each. Either I'll use them myself or offer them on make my day, I'll see. 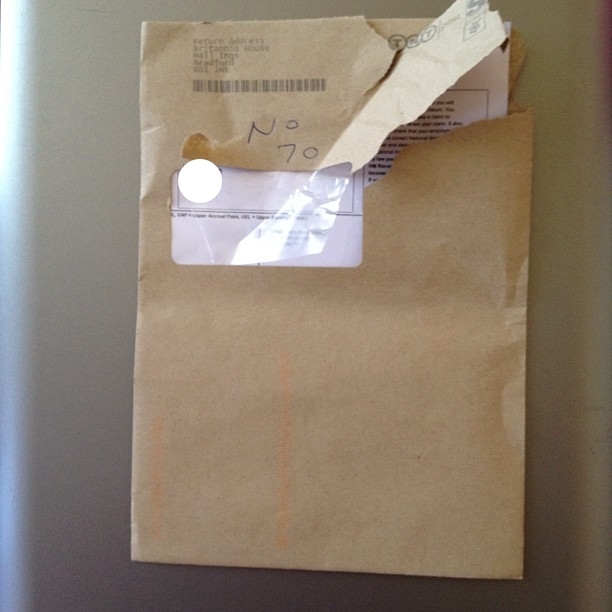 *Received my P60 through the post looking like the postman had a battle with it. Probably wanted to know if I earned more then him! 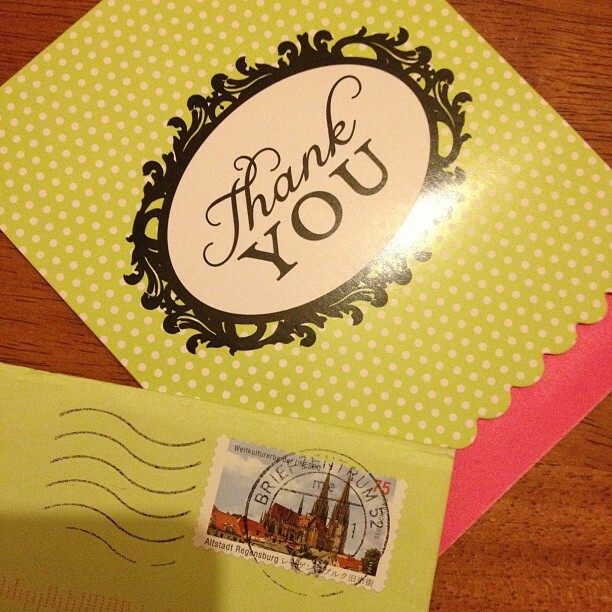 *A lovely thank you letter from someone who had their day made. They truely made mine whilst they were at it. *My niece stamped a letter and I love the randomness of it. I couldn't do it myself as I need it in the corners and straight. *Taping my letter ready to write on. *Do you think letters should be posted on a blog that you have written for the world to see? Is it an invasion of your privacy or a friends? *Do you ask permission of the person whose letter you post if you can show their name and address? *If you send a friend a present are you happy with them sharing it on the Internet? As for my address I've only had one person do it and I still can't understand why as they blurred out their own address... if you don't like it why do you think I would? I do hope one day to have a P.O.Box number so that I can freely use it on here but right now I'd rather not anymore. As for presents its a tough one, all my letter sets etc... are kept in one place, so I don't actually know what I received as gifts and what I bought. So if it fits in with a theme or I think a friend will like it, I send it but I don't knowingly re-gift. I have started putting labels on now though to stop me sending gifts on. All my sets are what I like which is why I bought them but also I use the same stuff as presents too. I guess I don't mind. What are your thoughts on letter writing? I guess you already know that I do post letters and mail I receive on my blog... but I try to not show anything personal. (I think the normal "Hey Caddi, how are you? 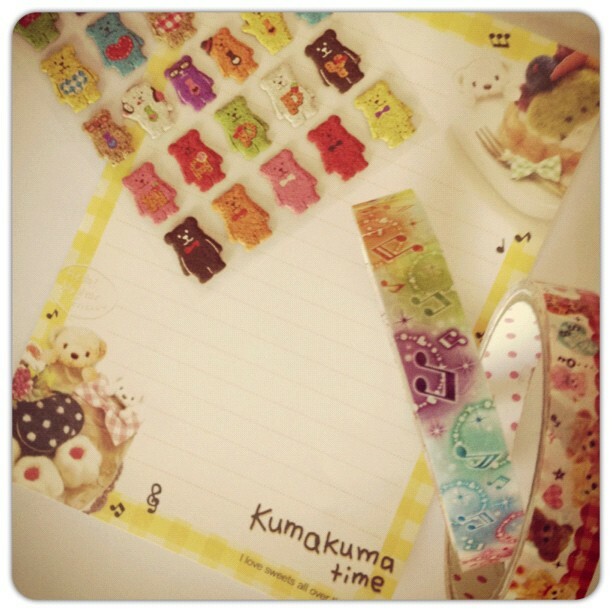 Thanks for your letter!" 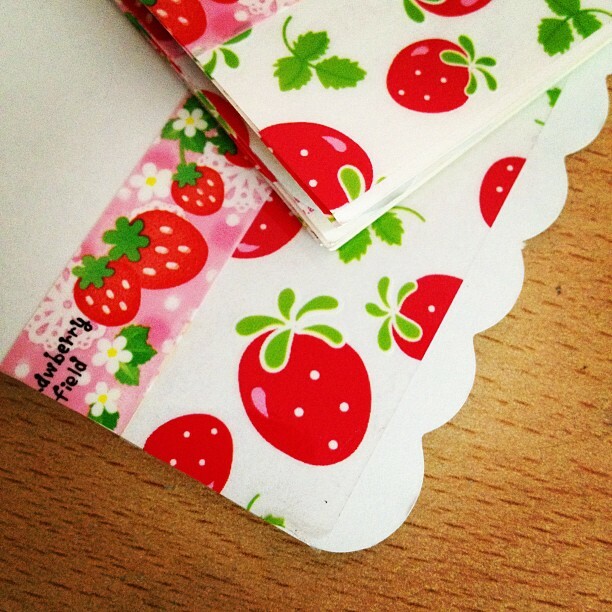 at the beginning of a letter is not too personal.) I have seen some blogs where people show the entire letters of other people and I would be uncomfortable with that. I also make addresses invisible of people who don't have their address on a blog somewhere and I shorten names of people who don't write a blog at all.... like my penpal "M. from the Netherlands" or "F. from Italy". I don't really mind friends showing presents I sent them on the internet - again, if it's nothing to personal. I wouldn't want anyone to show pictures of me or anything like that, but let's say I sent them a letterset - why not? I was thinking more of full letters as those on Instagram, I could read the entire thing, made me wonder about some of the things I write and say in letters... eek! None of the people I write to blog so I've no idea really how they'd feel even though they do pass through mine when they get the chance. If it wasn't for crafting I probably wouldn't have ever done it either but I love sharing what I make and keeping like a diary of it. As for photos, definately not. Theres none of me or my family on here. Only my nieces hands and feet which her mum said were ok. Yes I have add NO Prisioners to my FB's and I prefer to have a P O Box I just feel a bit better know that not everyone knows my home address. Jo-Anne The actual FBs etc... don't go into prisons as they aren't allowed. Like I said it was a lady creating this list and I'm sure there are many more people doing it, so if they want they'll just copy our addresses. Its just easy to ignore those letters. I was just curious so asked. I guess it depends on the contents of your letters, mine have everything and anything written in them so I don't want the whole world reading exactly what I've written. Never know that person might be reading it! I feel like responding to this as it's used to be a 'thing' that's on my mind too. Anyway, to answer you questions- I was shocked to see some people (esp. in their earlier blogging phase) posted the whole letter for the world to see and read (luckily, not mine though)! I think it's really intruding someone's privacy. I did displayed a letter in my blog (the first letter I received in the 2012) but I blurred everything out and I told my pal that hers will be featured for that post but if she didn't like it, I'll take it out- but she said OK. And... I'm not really happy if my pal showed everything I sent her to the public. Well, maybe a teaser (showing a bit of this and that) is ok but not the whole thing... Maybe because I love gimmick and surprises :) Well, whatever it is, I think letters should be discreet to only two people. Anyway, as for name, I used my real name but I don't really feel bad displaying it (for the time being) as they are millions of other people with the same name in my country. What makes a different is that this is my real name but others (not all though), mostly, well 'Aida' is their nick name (maybe being shorten from a much longer name). What people don't know is that, I have a middle name too that I used mostly for my corresponding. I mostly like to keep it exclusive only to my pals :) I've been thinking about this a lot too lately and there were times that I wanted to use a nickname to conceal my name but, I also want to retain my surname 'Yusof' as it's my father's name, It's like this is one of the many things that I can do as a daughter- retaining his name, like keeping up his legacy while he's still alive and will keep on it in me even when he's no more in this earth. On my letters I use my whole name, its not a problem! I don't use peoples names in my letters though (as in people that I work with and friends that I meet). In my first letter I share all my families name but then I just find it easir to say sister, older brother and younger brother as over the years its something I've got used to. When I used to talk to my friends and mention their names, they would say if that your older one or younger one so I guess I got into a habit of writing it too. It's not that I choose to keep it private. I'm glad you shared your opinion as its interesting. when you skim through my blog, you will notice that I always blur out the content of written letters and most of all addresses. I don't want my address plastered all over the internet, so I don't do it to my pallies. I honestly don't know why people post unblurred pictures of their addresses. The internet is full of creeps! I do get it when people have PO boxes, but other than that? I don't get it. I really like and support the way you handle it and take care of it! Jen, I've actually seen your posts on your Instagram and agree that I can't see the complete contents of your letters. With the name its quite nice to see your writing too :). Well that's my thought exactly that the internet if full of creeps and I'm worried about someone turning up on my doorstep. Saying that though it has crossed my mind with letter writing too. When it comes to letter posting, that's a tough one. I have pals who will post them on their blogs and even on Facebook. I don't mind, as long as addresses (at the very least) are blurred out. Names can be nice too, but I think that the address should always be blurred or covered with a little paper or anything really. That's especially odd if someone would post a letter and blur their address, but not the other person's...that makes no sense. I don't tend to use my full name either, for the same reason, it's unusual. With FB's, I only post my PO Box address, but anytime I post in them now, it's my e-mail address, for that same reason. I have no idea where/with who the FB will end up at, and I don't know what they're going to do with the information. There are lots of good people out there...but there are also some out there with really strange ideas. I don't post photos of mine as mostly, I just don't have the time. I've tried before, but did terrible with keeping up with it. So I commend those who do! Amy with writing to you I know how much you are willing to share which is why I only showed as much of your letter as I did. I always share postcards as I think its such a shame not to show such beautiful places. I guess its just a case of respecting people and asking their opinion. 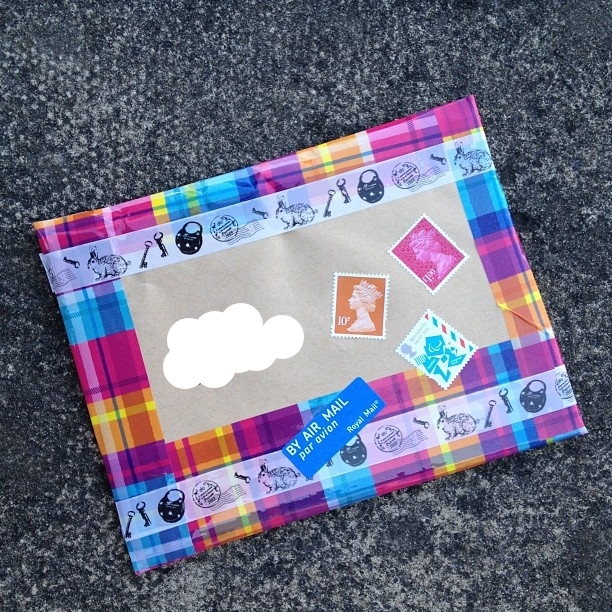 I can understand the private issues as if you enter the big world of the web anything can happen but its one thing covering your own back but leaving a friend or a package exchange open to problems as you've posted photos of them without them being aware of it or clearly showing their home address. I guess the rest isn't all that much of a problem. Most people know my name on here, those that haven't ever swapping with me or written to me don't know it but I wouldn't think twice of telling them if they asked. Its just that its a case of keeping it between the 2 of us.